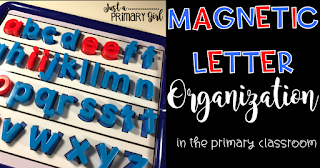 I have had so many friends ask me to share my Magnetic Letter Organization with you! 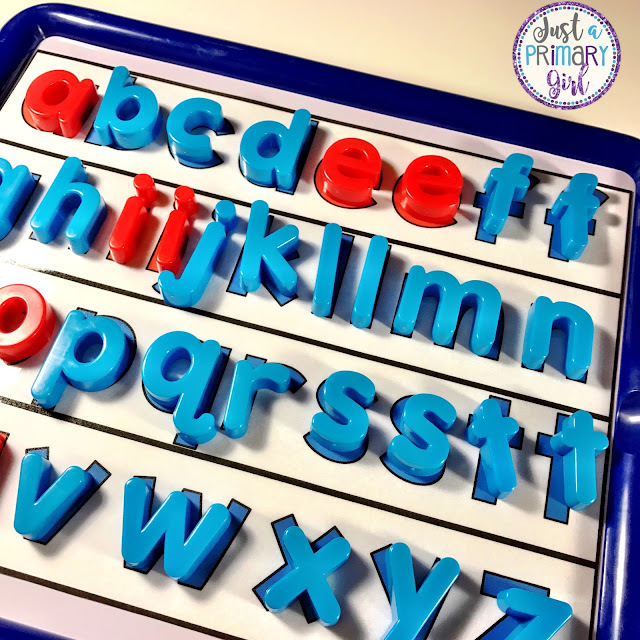 Do you use magnetic letters in your classroom? 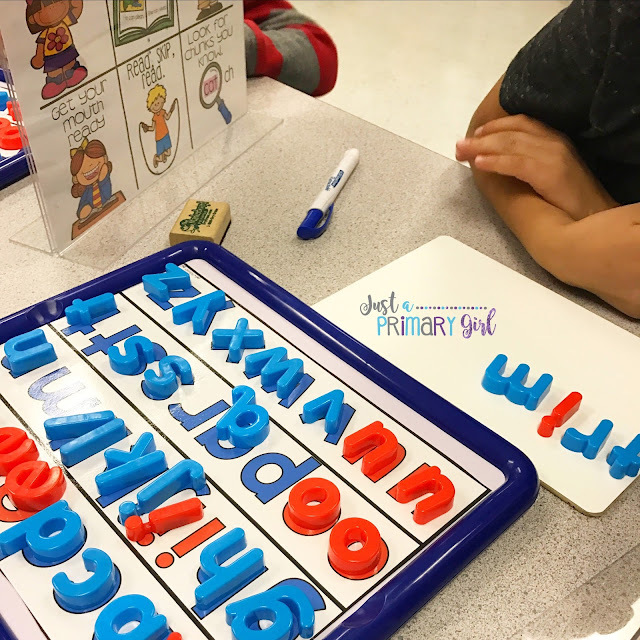 I use magnetic letters in my class A LOT. I mean, a lot. I use them during morning work for some students. I have some students use them during center time or stations. I have my students use them daily during guided reading time. 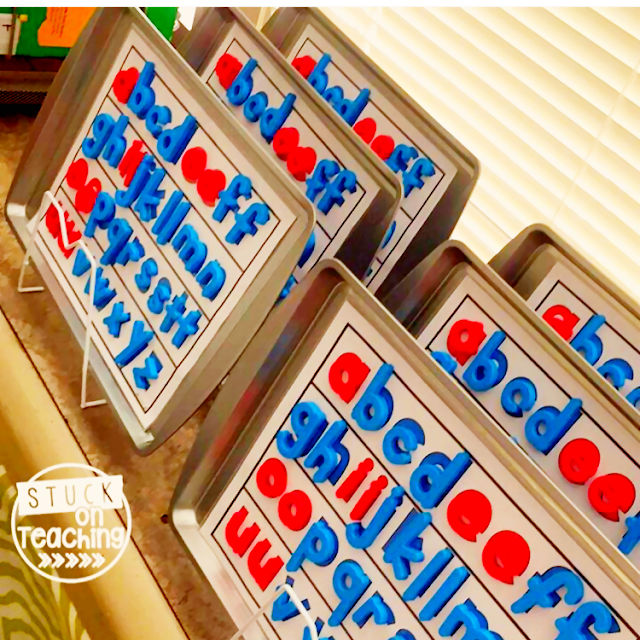 Magnetic letters are something that are used multiple times a day - EVERYDAY in my classroom. I noticed that my students spent a lot of time figuring out where to put the letters when they are done. Or, they just throw them back in a bucket and spend a ton of time looking for the letters they need for the activity. This slows them WAY down and cuts the amount of time working in half. It was getting so bad, that during guided reading, I was taking letters out of kids' hands and putting them back because it was MAKING.ME.NUTS. I needed a solution!!!! I thought, ok what can I do to make this more effective? Well, here is my solution! 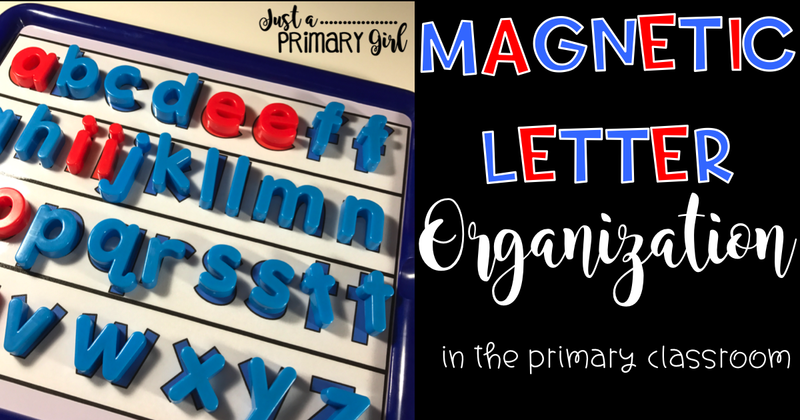 Magnetic letter return sheets! 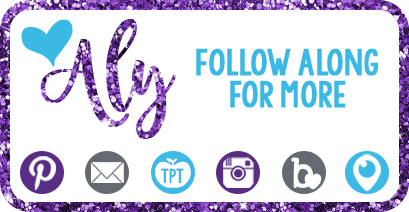 Click the picture below to go to my TPT store to see the sheets. 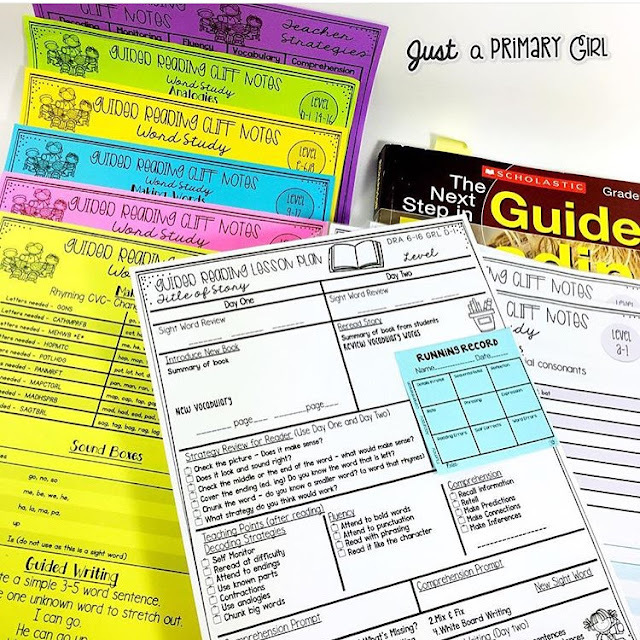 I use these during guided reading group times. My students each grab a board that has the letters already on it. When I do my lesson plan, I spend about 4 minutes with them building words. 4 minutes out of 20-25 minute lesson. That is not a ton of time. What's worse - when it takes students 5 minutes to return the letters. This makes that part of my lesson take up almost 10 minutes. I either had to give them all of the letters I wanted them to use, or I needed a way for them to find the letters they needed and return them FAST! If you click HERE it will take you to where I got the clear picture frames to my reading strategy posters. If you click on the picture below - it will take you to the Reading Strategy Posters pictured. This letter return board has saved SO much time. My kids are actually getting better at letter identification, AND they are getting FAST at it. With special needs students, pre-k and kinder babies - this is HUGE! During my guided reading time, I use this pack. It tells the students what letters to grab. Then, we build between 4-7 words. It is based on their guided reading (or DRA) level. You can click on the picture to check out the pack. 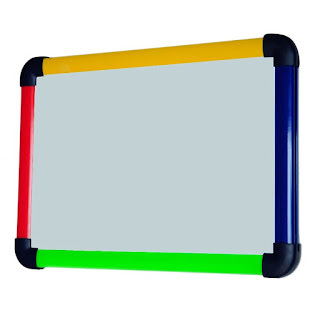 If you click on the image below, it is going to take you to where you can get the magnetic boards that they go on. These boards are double sided dry erase and magnetic. The best part is that they are PRIME on amazon, so you don't need to wait weeks to get them, like I did! I have had SO many people ask where I got my letters for the boards. I got my letters from Lakeshore Learning, and they took about two weeks to get to my school. I found these letters from Amazon, and bonus again THEY ARE PRIME! Can you tell how much I love Amazon? You can get an entire tray completed with one container, with a few left over. They end up being the same price as the Lakeshore ones, but they are prime, so two days, folks, two days! Click the picture below to find the letters on Amazon. I have had many people ask, what else do I use these letters for to make the purchase of boards and letters worth it? I use them for interactive sight word stations in my classroom. Students scan the QR code and then they watch, listen and learn. They build their sight words with me interactively. They need magnetic letters for it. I have students do this activity during morning work time and centers. 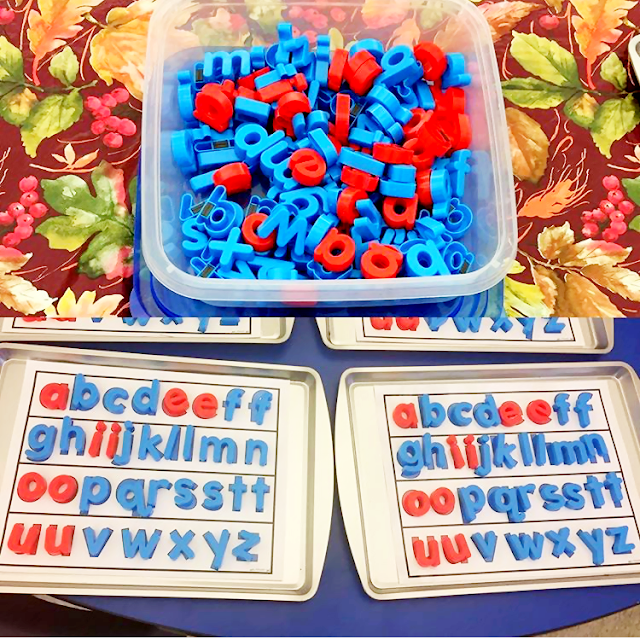 Click the picture to see all the different interactive sight word stations that you can use these letters with. 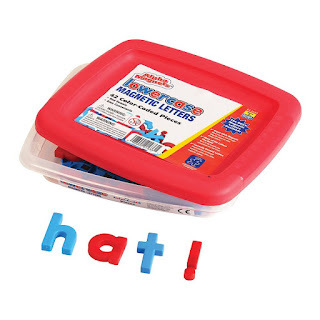 Some people have used cookie trays to put their magnetic letters on. I can't share where to find exact ones that are magnetic. I have heard some people have used the dollar tree. My dollar tree didn't have the right size, and they weren't magnetic. Other people found perfect ones at their dollar tree! Check them out! Stuck on teaching found hers at the dollar tree! I kept my boards on this holder at first. It works well, and I liked it. You can click the picture to grab it. There was something about this sleek, white, pull out tray that just makes my heart skip a beat. You can click any of the pictures to grab it. I LOVE that it comes literally the SAME DAY with Amazon!!!! I don't have the patience to wait ten business days for Ikea. The nearest IKEA is not close, so going to get it is an all day trip. So, thanks amazon for selling this for me! Isn't it just beautiful!? The trays slide in and out. 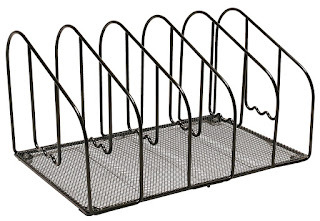 It only has four trays, but there is enough room to put one on the bottom. It works perfect for me. Plus, it fits the boards exactly. It also fits into my cube organizer! TEACHER HEART HAPPY. So again, here is a recap of what I use with my magnetic letters. 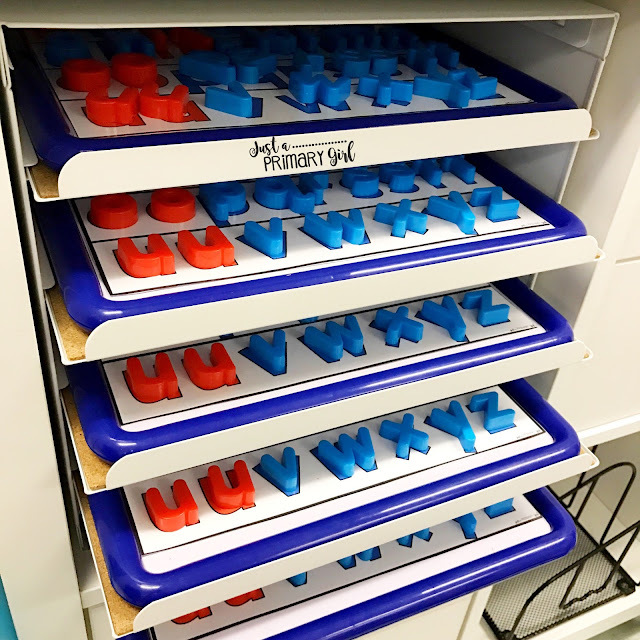 I promise you will NOT regret buying the magnetic letters, the magnetic boards, the tray holder and my magnetic return sheet! It will make your life so much easier. 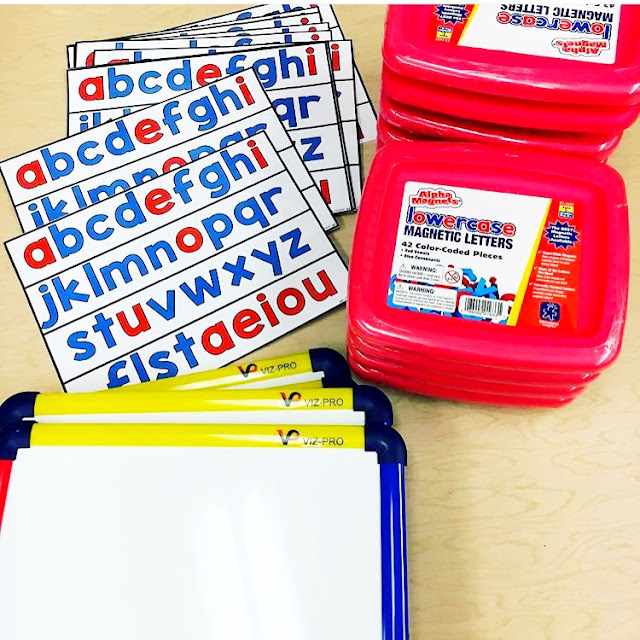 I am going to give away 1 magnetic board, 1 set of letters, my magnetic return sheet and my Set 1 Primer Interactive Sight Words to try! Great post! Very informative and super helpful! I can not get the clear picture stand link to work for me. Would you mind posting the link? Thank you so much! I would love these, as would my students! 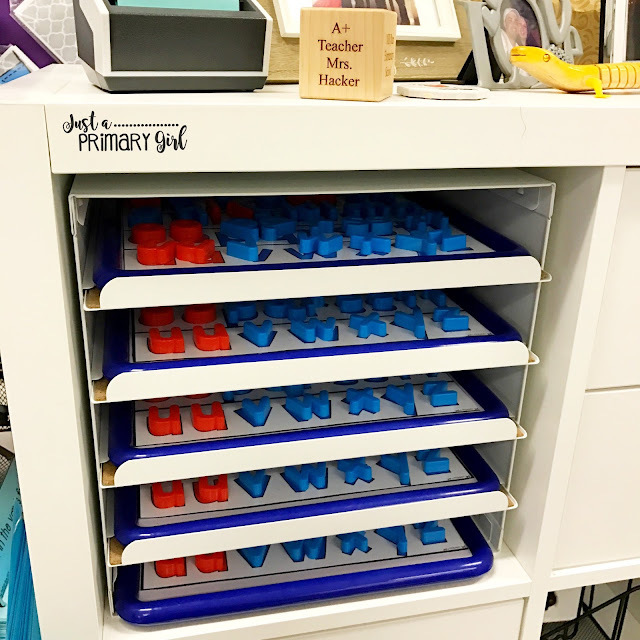 We work hard to teach our students organizing skills and this would be so helpful! It would cut down the search and find part of center time by quite a bit as well as help those who aren't 100% sure of the alphabetic sequence. Thanks for the great product! I love all your ideas on this post. 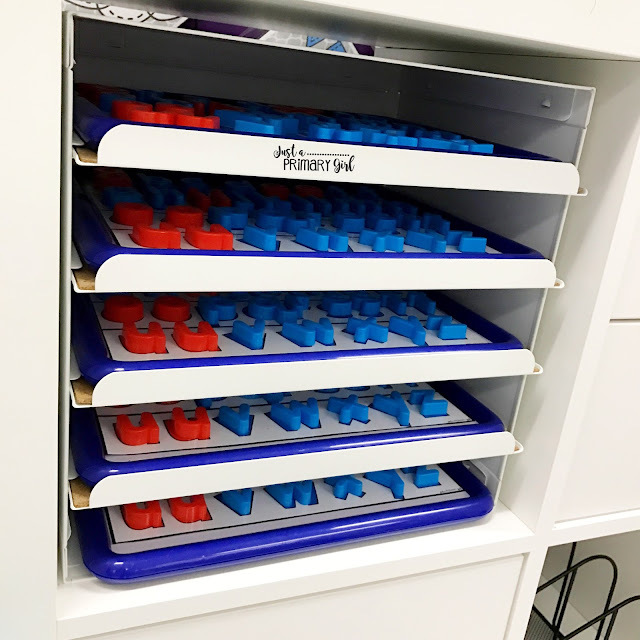 I've tried figuring out how to keep my letters organized and this is perfect! Hi Aly! I love your produces and love reading your blog and instragram posts! I purchased all of the items in your post and I was really excited to use them! I received the order today and was excited to start putting them together so I could use them next week. Sadly, the boards you linked are to small for the template you have. Apparently there are 2 sizes of boards? The one that came up in the Amazon link is 11x8, which is too small when you print the letter template off from your TPT store. I looked at the other size which is a 16x11 to perhaps purchases instead and realized that it probably won't fit into the drawers of the IKEA shelf you recommended. So, I decided to reduce the size of the template when printing. It now fits on the board. I also purchased the magnetic letters from the link you posted. They only contain 1 of each consonant and the extra vowels. But, since I reduced the size of the template page, the letters are too big and do not fit onto the letters on the board. I have the Lakeshore Letters magnetic letters, but I don't have enough double letters for the six sets of boards I need--and my OCD doesn't like to mix the letters together :) I just wanted to share these things with you in case you wanted to update your post to include more specific information on products and how you put this all together for use in your room. How do you attach the sheet to the tray?